We shall first briefly describe Poisson manifolds, and the usual phase space reduction process by means of coisotropic submanifolds. We indicate the (deformation) quantization programme associated to this by deformed algebras, their modules, and the algebra of endomorphisms. We then deal with differential resolvents or Koszul-Tate-resolutions of (function) rings B (of submanifolds) seen as modules over the (function) ring A (of the ambient manifold). On the module of all module morphisms of the resolution algebra we define the `big bracket' (defined by Lecomte and Roger) which is an even graded Poisson bracket. It is then possible to combine this with the Poisson bracket on the manifold to an even differential graded Poisson algebra structure (for projective resolutions this can be made explicit by means of the generalized Rothstein bracket) whose cohomology is isomorphic to the reduced Poisson algebra in degree 0, a generalized version of the BRST or BV construction for Poisson geometry. We comment on possible quantizations: if one can turn the function ring B on the coisotropic submanifold into a module of the deformed algebra A, then the above considerations may be seen to `quantize' and realize one of the many forms to compute Ext_A(B,B) as has been indicated by Sevastyanov. We intend to give an introductory mini course to methods of gauging field theories on the one hand and its relation to new types of geometries on the other hand. After recalling the conventional setting of gauge theories, related to isometries of the target space of the field theory in question, we show that one can enlarge those methods and apply them to a much wider set of field theories, yielding new types of gauge theories. In the process of doing so, we will encounter Lie algebroids or higher Lie algebroids over a base manifold equipped with suitably compatible geometric structures. We will devote a bit of time to studying these geometries in their own right. 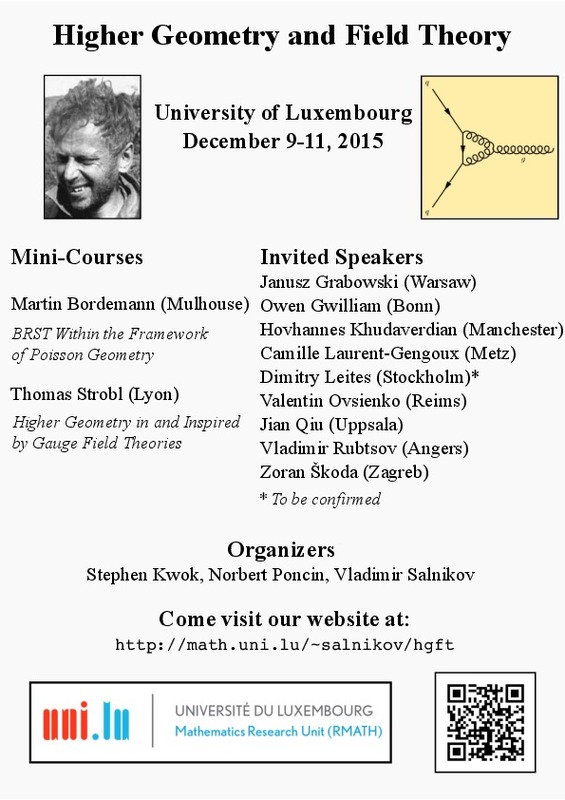 In the last part of the course, finally, we will present a recent discovery of a curved Yang-Mills-Higgs theory. The target space of this theory is governed by the curvature of a connection living in a Lie algebroid. If its curvature is zero, the Lie algebroid reduces to an action Lie algebroid and and the theory reduces to a conventional Yang-Mills-Higgs theory. For curved target geometries one obtains a completely new theory, which awaits to be studied on the mathematical as well as physical level. We describe a quite general covariant and geometric set-up of higher order Lagrangian mechanics for which the (higher order) velocities get replaced with elements of a graded bundle, i.e. a higher generalization of vector bundle. To realize this, we employ the notion of a linearization of a graded bundle and a weighted Lie algebroid. The latter is a manifold carrying simultaneously the structure of a graded bundle and a Lie algebroid that are compatible in a precise sense. The approach we develop makes use of first order mechanics on Lie algebroids subject to affine vakonomic constraints and, as a result, we are lead to consider relations as opposed to genuine maps. This talk will introduce and describe the idea of an L-∞-space, which presents a particularly tractable type of derived stack, in much the same way that an L-∞-algebra presents a deformation problem. Lie algebroids will provide a motivating source of examples. We hope to explain applications of this formalism to quantum field theory at the end. We define the modular class of an odd Poisson supermanifold in terms of second order odd operator acting on half-densities. We study relations of the modular class of an odd Poisson supermanifold, modular class of an usual Poisson manifold, and BV operator (odd Laplacian for an odd symplectic supermanifold). We consider examples of odd Poisson manifolds with non-vanishing modular classes related with the Nijenhuis bracket of form valued vector fields. The talk is based on the joint paper with M. Peddie. We will describe in concrete terms the L-infinity structures associated to a singular foliation, and explain whhy there are all equivalent. We will explain how it relates to several classical constructions using Lie groupoids or bisubmersions. We will also give examples and counter-examples. I will describe a supersymmetric analog of the Coxeter frieze patterns, related with linear difference operators generalizing classical Hill's operators. (This part of the talk is a joint work with S. Morier-Genoud and S. Tabachnikov.) Using superfriezes as a starting example, I will then present an attempt to develop the notion of cluster superalgebra. We introduce the notion of bordered cusped Teichm�ller space as the Teichm�ller space of Riemann surfaces with at least one hole and at least one bordered cusp on the boundary. We propose a combinatorial graph description of this bordered cusped Teichm�ller space and endow it with a Poisson structure in such a way that quantization can be achieved with a canonical quantum ordering. A notion of decorated character varieties for Painleve confluented equations is introduced. We discuss various quantum algebras arised in this context. Quantization of Poisson manifolds by means of the symplectic groupoid is an approach proposed by Weistein as an alternative to the Kontsevich deformation quantization. There are several distinct notions of quantum groupoids in the literature. Most explored are Hopf algebroids (in several versions). Ping Xu exhibited appearances of Hopf algebroids in deformation quantization around 2000. I will present several examples which fit into his setting, but are studied in an explicit detail from a different point of view, with inputs from Lie theory, study of formal differential operators and physics. Then, I will use this insight to sketch a geometric generalization which fits the interpretation of quantum groupoids, but are more general than Hopf algebroids. Finally, I will outline a 2-categorical analogue.